How many is too many? Kim Kardashian certainly does not have an answer for that question! 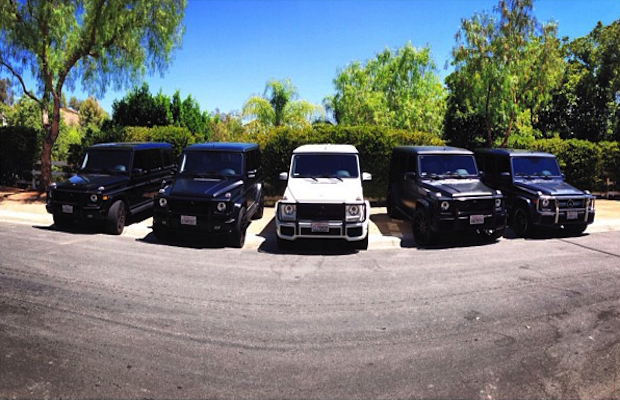 The reality show celebrity has about 6 Mercedes models right in front of her Hollywood home. And yes, she drives them all! Well, not all at once, of course. She’s got a huge parking lot full of outrageously expensive cars, summing up about $2 million, but Kim is keen on the G-Klass. “Got the first one”, she happily tweeted back in 2013, when she bought the Mercedes G63 AMG, which wasn’t even on sale yet. She paid $150 000 for the car that she used to call her new toy. That toy could be by far the cheapest, but most practical rides in her driveway full of super sports. It was not her first Mercedes, and certainly not her last. Kim’s step father chose an S-Class instead of a G.
The Kardashians own no less than 5 Gs! It is obviously weird for the star who wouldn’t be caught dead wearing the same pair of shoes twice, to buy so many cars of the same type. But it seems that she matches the Gs with her cloths. 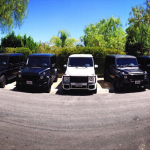 Recently, Kim Kardashian has requested a restyling for one of her SUVs. She chose to turn it from metallic to matte black. 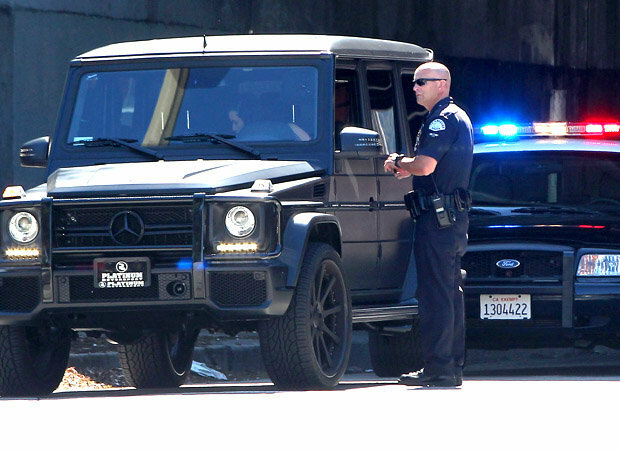 Kim damaged one of her boxy Gs this passed spring, on March 11th, as she was turning left on the Sunset Boulevard. The 33-year old collided with a car coming from the opposite direction. She got away unharmed and without a ticket, because apparently, it was the other driver’s fault for having the left signal on, but deciding to go straight instead. And it was not the only traffic incident that the reality show star was part of. A few months later, she was pulled over by the police for speeding about 20 miles per hour (32 km/h) over the limit. Well, it is not easy to hold all that 544 horse power back. The paparazzi claimed that she was able to flirt her way out of getting a speed ticket and drove away with only a warning. Her 16-year old sister also got in trouble for driving the a G Wagon around without a licensed adult in the passenger’s seat, when she only had a learner’s permit. Her SUV is $25 000 cheaper than Kim’s. Like mother, like daughter. Kris Jenner also sports a G. And she hasn’t even crashed it. Kim’s husband, Kanye West, owns an Mercedes SLR that Kim often takes for a ride. And the weakness for the Mercedes runs in the family. Step father Bruce Jenner has his own share of fun by keeping a low profile behind the wheel of a Mercedes-Benz S-Class. Kim’s step father has chosen an S-Class instead of a G.